GOOD MORNING my creative friends & welcome to day THREE of our 12 Days of Christmas! I do have to admit, I think this is my FAVORITE thing to do..... my 12 Days of xmas! I ALWAYS have the BEST TIME EVER creating all of these FUN Christmas projects! Okay, let's get to what I made here today! I had to take pictures of this on my desk because I could NOT get a good picture of this ANYWHERE else in my house:( But the last picture is of what is looks like hanging on my door! First of all, I want to say that this was NOT my original idea! I got the idea from HERE! Her name is Jill & she is AMAZING! 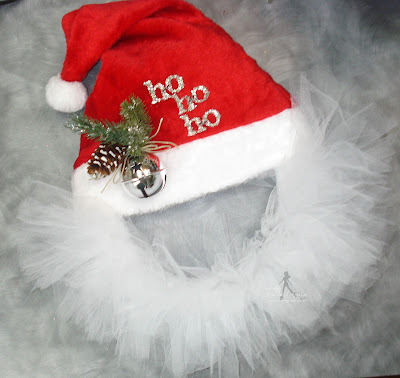 I saw this Santa tulle wreath she made & just HAD to make one of my own! Of course, I switched it up a bit to make it my own! To make my different, I thought it would look cute if I embellished the hat w/some leaves, pinecone & a big bell I had in my stash! AND, I used my "Lower Case Fun" Dies for the "Ho Ho Ho"! You can really see that well, but I linked the 2 letters together using a jump ring! 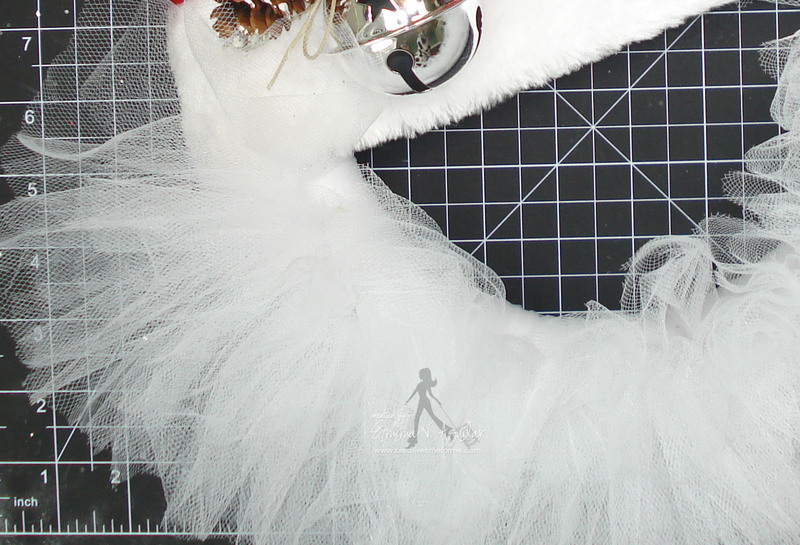 Here is a close-up of what the tulle looks like! You can see better instructions on how to create your own HERE! And, here it is hanging on my door! 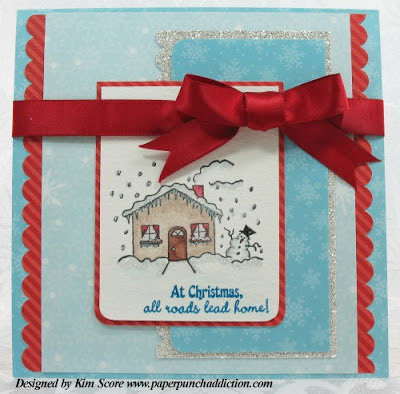 I am loving these Christmas kreationz...you have done it again...another super adorable kreation!!! Great job ladies!! I love the hat & scarf on the bottle!! All great creations! Thank you for yet another amazing give away, I know you like some pretty awesome things so I'm even more excited to see what goodies you have in store!! Oh gosh Emma what a cute Santa hat I have to say it's "Fabulousity" good how do you come up with all these positively awesome ideas I'm lovin' it you must dream in fabulous craft land how cool. Emma what a wonderful idea. I has a pink tulle and I try to make this one. Super duper cute. The designer team gave to us amazing ideas. Thanks for the opportunity. Days 1-3 have been so much fun, I can't wait for the rest of the projects. I don't mean this as a criticism, but the word is pronounced "tule" which rhymes with rule. Wow!! All of these projects are amazing!!! I love that santa hat!! absolutely gorgeous!!! What a fantastic Santa wreath!! So clever and great job making it so fun! Enjoying this blog hop and love all the inspiration! Oh my goodness...the prizes keep getting better and better and so do the projects. This Santa wreath is adorable. I've seen it on Pinterest, but glad to have your video to follow along with the steps. Thanks for another great start to the day. slbuller at fullchannel dot net. Totally love this! You are such an enabler, I have tulle for a different wreath, looks like I am gonna need more. Love the lowercase font alphabet. Your Santa Wreath is so cute - great idea! I am getting so inspired by all these great projects! Thanks for another GREAT day of inspiration!!! I think I need to make one of these for me!!! So adorable, Emma!!! LOVE your Santa wreath - and fabulous hop yet again!!! Very fun wreath! I like how you made it your very own by using your lower case dies on it for the ho ho ho. TFS and thanks for the chance to win! Wow, that wreath is adorable!! Emma, thanks for the chance to win all these wonderful prizes, you are so generous. So cute and a fun wreath. Super cute wreath! I wanted a new one this year for Christmas and this is it!!! I love you wreath! I think I have everything to make one. You were so good to make it your own. I WANT MINE JUST LIKE IT!!! and my Bff will too once she sees it so I will be making a few. I know how time consuming tying the tulle can be...I make tutus. Thank you Emma to you and the DT for even more holiday inspiration. What a super cute and easy wreath! Thank you for sharing the video! What a cute idea for a wreath! Love the bells and the sparkly words! What a cute wreath, love all the projects, cute as usual. Very fun wreath. I like how you made it your own with the special embellishments. What a cool spin on a wreath. Just ran out and got this stuff for kids to make for their own doors. Thanks! Very cute, I'm going to make a few of these!!! Thanks! Really cute wreath! I am really enjoying all the projects. Such a cute idea Emma! I enjoy your creative ideas. Looking forward to the rest of your ideas. That santa wreath hat is so cute. I will be thinking about making that next year. Very cute santa wreath...the white tulle is perfect for his fluffy white beard! I absolutely love this wreath!!!! Such an awesome job, Emma. that blue snowflake with all the extra bling really caught my eye. got to try that one too. Everyone's ideas are just so great!!!!! I want to give this wreath a try !! Love this super cute idea. Love your design team as well. I love all your projects and your products!!! I cannot tell you how much I am enjoying the 12 days of Christmas!!! OMG!! This is the cutest wreath!! Thank you so much for all this wonderful inspiration. Hi Emma, awesome project, thanks for sharing!!! what great projects by all the dt members. tfs. This is my favorite wreath this season! I pinned it!!! That's a super cute wreath. The DT projects are fabulous. Amazing Santa wreath!! All the projects are amazing!! As always thanks for sharing! Will be popping over to see Jill's projects too! This is adorable! All the projects have been amazing! Thanks for sharing your talent w/us! WOW, what a gorgeous wreath, saw Jill's projects also, unbelieveable. All the projects are so amazing. So much inspiration. Another wonderful "Emma-ized" project. Super cute-and the video is always a BONUS. Only Day 3 of your blog hop, and already, I'm close to bursting with ideas! Thank you for all the sharing & all the inspiring. So super cute! Wow. Using tulle as a beard was brilliant. I'm so glad you showed us Jill's idea all "Emma'd" out! What a fantastic idea. Gotta see if I got one of those wreath's. That turned out adorable. Thanks for sharing with us. Love it! Super cute! I have never messed with tulle before. 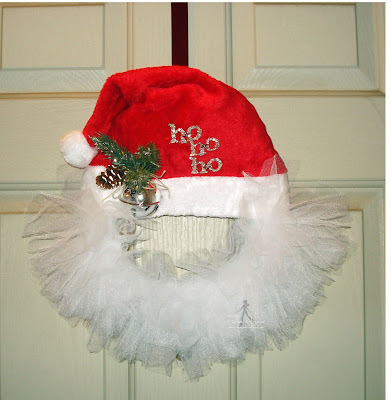 Super cute wreath, love the tulle beard! Wow!! This is soooo Awesome!!! Thanks for the link!! DT rocks today too!! OH MY GOSH.....This is SO VERY CUTE! I love this idea!! Oh my goodness the DT projects are so wonderful! Adorable wreath! Thanks for sharing! That is just too cute. Perfect project my seven year old can help with. Just too much fun...love all of your wonderful ideas. The Santa tulle wreath is really cute. The design team has presented a nice variety of adorable projects. What a fun Pin find for your project today...the wreath is so cute. I think the extra bling is perfect...ho-ho-ho! The Design Team was such an inspiration today with their beautiful projects...how do they come up with so many ideas. Love it and thanks everyone! Wonderful work, ladies. Love your wreath, Emma. super cute! I really need to start getting into my holiday spirit! Thanks for the inspiration! Such adorable and wonderful projects. Wow that's a great idea for a wreath. Having fun and getting inspired. Cant wait for tomorrows projects. Love the wreath! The tool just adds so much to it; and it's so adorable. This is such a cute idea! I am having fun participating in the 12 days of Christmas. What a cute wreath, Love all the DT projects. Love your wreath! Your "spin on it" is really cute! I love this adorable 'bearded' Santa wreath! I've already hung all my wreaths...now I'm trying to figure out whether I have room for another! I just remembered I have several mini Santa hats from a project years ago! I can definitely justify making some for doorknobs! Thanks for the opportunity to win! Your wreath is so cute Miss Emma! I love how you connected the letters with a jump ring-so smart and clever! I made a Thanksgiving wreath with the tule and I loved it, I got so many compliments on it. So I was planning on making one for Christmas and this one is perfect! Have you seen the winter one with the snowflakes?! Oh yes, I will be making that one too! lol These wreaths are so fun and addicting. They are even making them for birthdays-saying..."Claire is" (age) hangs down in the middle. Isn't that so cute?! 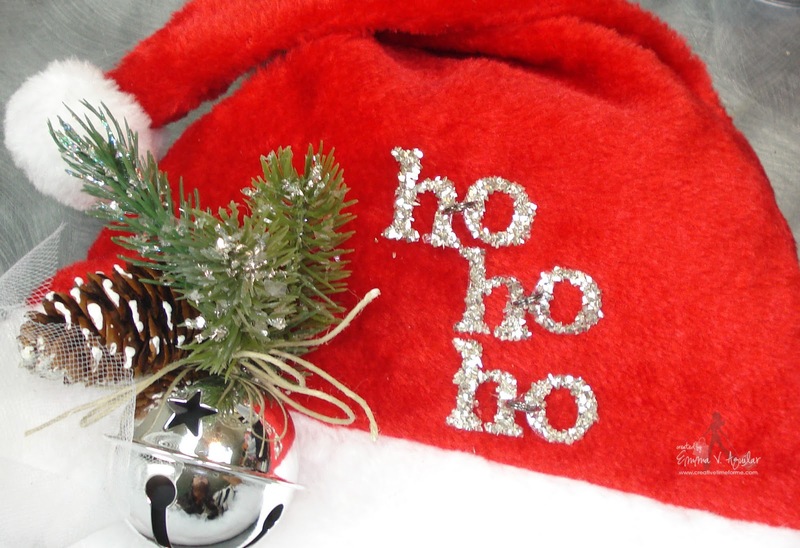 I love the santa hat wreath! So cute. I need a wreath for my front door and may just have to make this one. I love all of the other projects, especially the dog biscuits. CUTE! Emma ~ Altight this is soooooooo FLIPPIN CUTE!!!! OMG!! This is such a FUN and DESTIVE idea!! Oh my! I need to make this!!! Well the glitter "Ho HoHo" is ADORABLE, the tulle represents the beard PERFECTLY and pinecone/branch & jingle bell embelly is the topper of this masterpiece! WOW!! LOVE, LOVE LOVE this!! My sweet friend you are just ROCKIN 12 Days of Christmas ~ AGAIN!!! Let me say ~ the DT's are simply FABULOUS and so are their ideas!! WOW! TONS of inspiration going on!! Ho ho ho! I have never seen a wreath like this one. So cute! Love the wreath. It is perfect. Kim's dog bone creations are just too precious! You have such a creative team!!! TFS! You all are doing an AWESOME job!!!! Thanks for sharing!!! wow that wreath is so different, i love it how it's different to a normal wreath and all the other projects are fabulous lots of inspiration there! Such fun ideas by everyone, I need to get better about trying my hand at home decor! SUPER Cute & COOL Wreath! !Love it! Adorable DT Projects! !Love them ALL!! OH MY GOSH!!! I have never seen a wreath done like that!! It is adorable. You really do have some amazing dies. What a cute decoration! Thanks for the ideas. Emma, what a darling wreath! Love it, love it!! Thanks for the chance to win stamps! Oh my, I love the Santa wreath!! 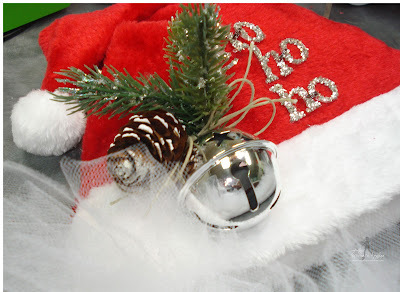 Love your Santa Hat wreath but the Santa Key caught my eye and I might just have to make one soon! I'd like one of these for every door handle in my home! SO cute ... I better get busy ..
Love your Santa wreath! It is just darling! It's sooooo fluffy! I love it! Thanks Emma! Festive wreath with the Santa hat on top. Love the lettering using your new dies. I WANT that house stamp where did you you get that! You have so much talent, love your blog....Everything is so cute! Thank you for all the great ideas. Loved it. How creative, a Santa wreath. The things you come up with are so exciting. Thanks for the chance to win. Cute wreath! Love love love all the designer team's projects! Cute Wreath! Love all the designers projects too especially that mailbox!!! What a cute idea. Like that you used tulle. That's so cool, I am sure hers is cute as well, yours is gr8t!! cute little santa mail box from the design team and love your creativity!!! What a cute wreath. Very clever. I'm going to try this one with my granddaughter. What a neat looking door greeter. I wasn't sure at first, but it hanging looks great! ALL the DT projects are wonderful too. What a great idea for a wreath, it is super cute. Loving all the great projects. Love your cute little wreath. TFS. Great projects..lots of inspiration!! TFS,LyLy. i NEED to make some of those hand sanitizer holders, love them! I absolutely love it. I'm off to Joann's to buy materials. Love that wreath...what a fantastic design! I am really enjoying this!!! GREAT job ladies and I love that tulle wreath! Fab! Awesome Santa wreath! What a terrific idea! Thanks for sharing. What a cute wreath - Love it. Thanks for sharing. I am so excited about this day's project! I just got into making wreaths and need all the inspiration I can get! TFS and for the inspiration! What a different idea with the wreath. I love Santa so who wouldn't want to walk in your front door? Kim's idea is SUPER for our friends' furry children. Love the wreath. I'll have to try it. Wow! This is a great idea, and so super cute! Such a great wreath.Love the santa hat!Thanks for chance to win! Your card is really Beautiful! Love the color choices...it has very comforting feel about. Great Job! !